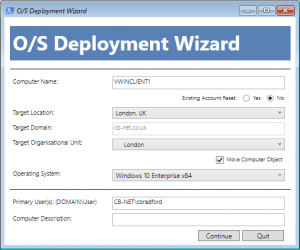 Fully test OSD Wizard outside of a Task Sequence environment (without the need for the SMS TS Environment COM Object) – including the ability to spoof platform information/ properties. When I first started working with SCCM/ ConfigMgr a few years ago I ran into several issues with upstream teams trying to deploy Task Sequences to devices that were untested (i.e. there were no drivers), power was not plugged in, the user supplied hostname was duplicated in target domain etc. This generated unnecessary Incidents, and delays in getting devices out to users. I became increasingly frustrated at the lack of ConfigMgr built-in capabilities to address these issues, so I turned to vbScript to write a HTA / front-end to address these issues. vbScript is now, several years later, a dying technology, so over time I have re-written the vbScript/ HTA in PowerShell, leveraging WPF and XAML to generate a user interface. Ensure content for this package is distributed to all of your DPs prior to continuing. Now we will modify your “Build and Capture” Task Sequence. Below, I have detailed actions for x64 architecture, replace X64 with X86 for 32-bit. This driver will now be injected automatically everytime you re-create your master image via the Buld and Capture Task Sequence. Now create this dynamic PowerShell script – we’ll call this during OSD or package deployment specifying a argument for the secondary language you need. This script should be named “_Install.ps1” and should be in the root of the package you create, along with the contents of the downloaded Office C2R. start-process -wait -WindowStyle hidden setup.exe -argumentlist "/configure dynamic_configuration.xml"
You can call this from within a ConfigMgr 2012 R2 SP1 Task Sequence using the “Run PowerShell Script” step, configured as below – note I use a TS variable to pass “fr-fr” or “de-de” to the dynamic XML file creation. You could simply type the language needed and work out the logic to get the right package to the right machines a different way. Click to run offers a relatively pain-free way of packaging Office 2016, but it does present some challenges when deploying via SCCM or similar enterprise tools. Follow the steps below to enable deployment of Office 365 via SCCM 2012 – I’ve tested this against Windows 7, 8.1 and 10 – YMMV. 5. Create a PowerShell script “_Install.ps1” within the root folder of the Office 2016 package/application – contents below – and call this scritp from a “Run PowerShell Script” task within your Task Sequence. '<image path>'. Package is not applicable: 'C:\Program Files(x86)\Windows Kits\10\Assessment and Deployment Kit\Windows Preinstallation Environment\amd64\WinPE_OCs\WinPE-FMAPI.cab'..
ConfigMgr : Are you cleaning up your WIMs? In a quest to reduce WIM size I came across a couple of tricks that gave me a ~25% reduction (YMMV) in my master image size for a Windows 8.1 build. Author Chris BradfordPosted on 21st November 2015 20th September 2016 Categories ConfigMgrLeave a comment on ConfigMgr : Are you cleaning up your WIMs? "Cannot edit the object, which is in use by '<user>' at Site '<site>'." We’ve been tetsing a 64-bit build of Windows 7 SP1, that includes IE 10. SCCM 2012 R2 CU1 performs both the Build and Capture Task Sequence alongside all Deployments of the ‘golden image’ to client devices. The symptoms of this issue were simple, all “Deploy” Task Sequences were failing – on closer inspection it was clear that the machine had not joined the domain, and it had not used the hostname as defined in the OSDComputerName Task Sequence Variable – in fact the machine was using the name of the machine that we used to perform the golden image creation under the Build/Capture Task Sequence! This was surprising as the Build and Capture Task Sequence was completing successfully, every time.